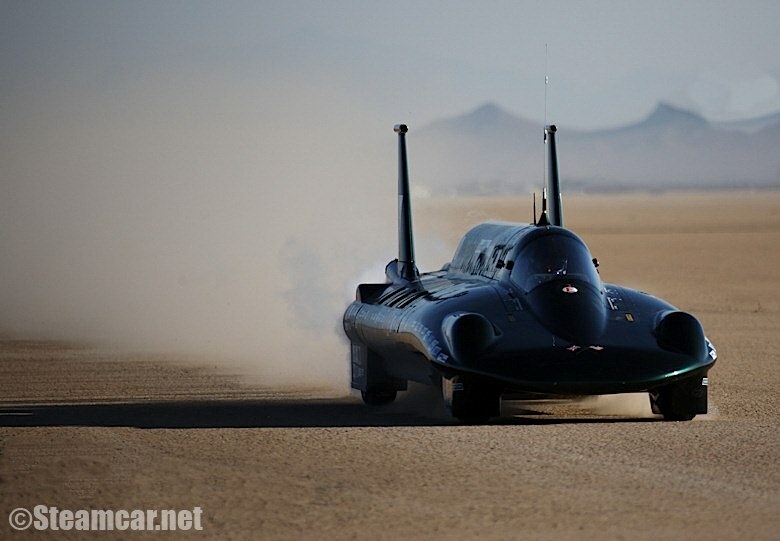 Testing continues on the British steam car challenge at Edwards Air Force Base. After displaying some problems requiring replacement of two of the 12 boilers, and some loss of steam due to a stuck bypass valve, the team has made the best run yet – reaching 94.9mph with more to spare. So things are looking good for the attempt on the world’s longest standing speed record – which stands at 127.659mph set by Fred Marriott in a modified Stanley steamer. Don Wales the test driver – holder of 8 UK Land Speed records with his Bluebird Electric project – has been keeping a blog recording the steady progress on the car. It’s not often a steam car gets offered for sale in Australia – and when one does – few would match the quality of this newly restored Stanley CX 1903. The attention to detail is superb. The car is offered as part of a deceased estate and is fully functional. It is also London-to Brighton eligible. The car boasts a new boiler, burner, tires, leather, paint, basket etc. and its fold-out seat enables two additional passengers to be carried. Check out the photos – then contact Ken Russell (himself a Stanley owner) for more details – but only if you’re genuine 🙂 He can be contacted in Melbourne Australia Vic, via the email link above. For more information about Stanley steam cars, check out the UK’s Steam Car Club website run by Jeff Theobald. Ben Parr of Mashable wrote this post on “5 social media blunders and what to learn from them“. The five seem to be divided between where the social media themselves have blundered and where users have blundered in using social media with examples from Facebook, Twitter and YouTube – but they are applicable across the board. If you make a blunder, be up front, apologise and set about communicating with your audience to fix the problem. Both Facebook and a campaign on YouTube could have learned from that. Sony didn’t, to their cost, and Facebook did, to their gain. Basically, people do make mistakes, and most people will forgive if you’re up front about it. Don’t try to stonewall or cover it up, because that will just dig (not Digg) you in deeper. The second aspect of communication here is that you can avoid a lot of social blunders by knowing your audience – and you do that by communicating with them, being part of the community and testing the market or at least preparing the way with good announcements up front, then a test version which people can visit and comment on, before you launch that new feature or product. Secondly, (which is really third, since I broke the communication bit down into two) it’s about people – the example about the Twitter user who became emotionally charged and did a public meltdown showed poor nettiquette and a poor appreciation for the fact that they were actually talking to people. The trouble with rapid response social software, like Twitter, is that there is little time for reflection before hitting the button – and the response can be over-the-top before you’ve had a chance to reconsider some ill-chosen words or actions. So clearly, the appropriate way to respond is to write drafts, then do something else for a couple of minutes, and then return to the draft – if you still want to send it, go ahead, but that pause can take the heat out of an immediate response.